For all those who do not want to go cycling without their mobile phones, GPS, MP3 players and other electronic devices and do not have access to a stationary charging station comes the "bike mobile" E-WERK. If the compact device is connected to the hub dynamo, the electricity generated by the cyclist's muscle power does not have to be used by only the lighting fixtures but can alternatively be processed by E-WERK. The energy is given off via two included connection cables that tinkerers can equip with plugs suited to their individual applications. Alternatively, the user employs an also included USB cable - the standard connection par excellence that offers compatibility with a wide range of devices - making sure that his electronic equipment does not run out of power while he is on the way. A small stylus that is housed at the bottom of E-WERK is used for adjusting two turning knobs controlling voltage (2.8 to 13.3 V) and current (0.1 to 1,5 A) quickly and variably for all the usual applications. E-WERK provides power of up to 16 W, and all that with idle losses of only 0.03 W at 30 km/h! At a speed of 15 km/h, E-WERK already charges as fast as a standard mains connected charger. An extension cable offers the possibility to tap into E-WERK's energy supply at virtually every spot on the bike. Cable screw connections keep the all links securely water tight. In order to mount the "miniature powerhouse" on the bicycle frame, three differently sized o-rings and cable straps are included. Some devices, such as the 3GS iPhone, require a constant voltage from the charger. For devices like this, an intermediary or buffer cache battery must be used. The E-WERK will charge the battery, which then charges the device. The Busch & Müller cache battery (available here mid February, part # B&M461A) can be charged by the E-WERK while simultaneously charging the device. A wide range of connectors are included with the E-WERK, so you should be able to connect whatever device you want. I'll have photos of the E-WERK mounted on my bike soon. For now, you can download the User Manual. When you get your E-WERK, it is imperative that you resist the overwhelming desire to throw it on the bike, connect your device to be charged, and head out on a ride. You MUST read the manual first. You must properly set the voltage and amperage for the device to be charged. And if you will be using the E-WERK to charge more than one device, you must not forget to properly re-adjust the voltage and amperage settings for the new device. The E-WERK is compatible with most devices. One known exception is the Apple iPhone, 3GS and later models, which will only work if the charger has a constant 5 volt output. When the cyclist is starting and stopping, the output of the E-WERK will drop, and some devices including the iPhone will shut down. Also, some devices can't operate at all while they are charging. Busch & Müller makes a cache battery for use with the iPhone and other devices requiring constant voltage. This will act as a buffer between the E-WERK and the device in question. Use the E-WERK to charge the small cache battery, and the battery will then charge the iPhone or other device at a constant 5 volts. And all this can happen simultaneously. The iPhone 3G and earlier are not affected by this issue, so the cache battery is not required for the 3G and earlier iPhones. Please click this link to download the E-WERK manual. It explains how the E-WERK functions in great detail. Please don't use the E-WERK with the 1.5 or 2.4 watt dynamo hubs you sometimes see for sale. These are very cheap, low power hubs which only exist to satisfy the minimum requirements for bicycle lights in Germany, and are generally used by people who never ride at night but must still have functioning lights in order to avoid a ticket in the middle of the day. Duh! Some devices cannot simultaneously run and be charged directly from the E-WERK, but instead must be charged by another battery. This is because they will shut off if the input power drops below a certain level. The cache battery provides a constant power output to your device, so the device will continue to run, and/or charge, while you ride, regardles of your speed. When you stop, the E-WERK is no longer providing output, but the cache battery continues as long as it has a charge. The Cache Battery is normally charged from the E-WERK. But, what if you want to start your ride with a fully charged Cache Battery? You can do it with the battery charger for the Busch & Müller Ixon IQ Speed headlight, and a special cable. The Ixon IQ Speed charger has two power settings, and to charge the Cache Battery, you must only use the low power setting on the charger. The Cinq Power Pack II is made by Tout Terrain in Germany. It is a compact but powerful battery that can be charged by the E-WERK while you ride or by any USB outlet while you sleep. 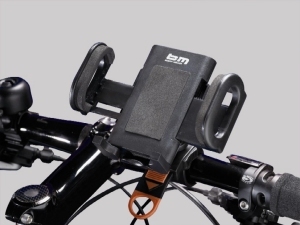 It outputs via USB keeping your Garmin or mobile phone charged while you ride. 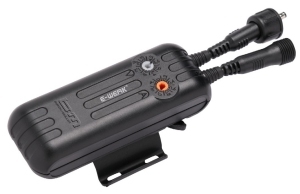 Set the E-WERK to output 5 volts and .5 amps to charge the Cinq Power Pack II. 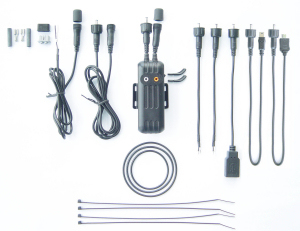 See full details about the Cinq Power Pack II on this page. Some GPS users report that their device won't run while charging from the E-WERK. We believe that this only happens on certain models when you use either the Micro USB or Mini USB connector attached directly to the output of the E-WERK. However, the E-WERK also ships with a standard USB connector, as well as standard USB to Micro and standard USB to Mini cables. So, if you find that your GPS won't run while charging from the E-WERK, try using the standard USB cable, and then the standard USB to Micro or Mini (whichever your device requires) cable provided with the E-WERK. Then, you should be able to charge from the E-WERK while you ride and have full use of the GPS device. Most devices that charge via USB need .5 amps. Some devices require more amperage to charge than others. And hub dynamos have only so much amperage to give. If your device requires 1 amp, your hub dynamo won't be able to charge it. You should check the specifications on your device and determine that the input amperage is below 1 amp before buying the E-WERK. Having a cache battery will give you more run time, but eventually the draw from your device will be greater than the hub's ability to charge the cache battery. 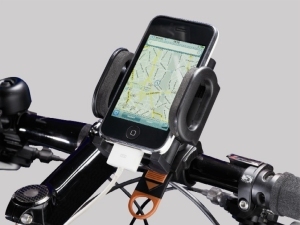 A handlebar mount for holding the device you charge with the E-WERK is also available. The Universal Cockpit Adapter mounts easily to the handlebar without tools. Thick cellular rubber coating on all contact areas of the holder cushions shocks and prevents scratches even on the most sensitive surface. The adapter opens gently upon pressing the rear release button. The holder's inclination can be adjusted variably, thereby offering optimal visibility for every kind of display. An opening at the bottom of the adapter provides enough space to connect cables, so that power supply for inserted devices is ensured at all times, e.g. from the revolutionary E-WERK charger. Remember that while the E-WERK can be used in all weather, your electronic device might not be weather proof. If you have a current Busch & Müller battery light, such as the Ixon, Ixon IQ, Ixon Speed, Ixon IQ Speed or Big Bang, you can use the E-WERK to charge its battery. With the Ixon or Ixon IQ, you plug the output of the E-WERK directly into the charging plug on the underside of the Ixon. With the Speed series headlight, you plug the E-WERK's output into one of the battery leads, and the headlight into the other battery lead. If you normally use two Ixon Speed headlights connected to the one battery, you'll only be able to use a single headlight while charging with the E-WERK. See the PDF for all the details.